Today's Scripture portion is loaded with instructions, for many aspects of life. Each verse is crisp and clear delivering direct message from the Lord! It may be worth spending a few days to discuss each one in detail. 1. How to trust in the Lord? 2. How to dwell in the land? 3. How to delight in the Lord? 4. How to commit our ways to the Lord? 5. How to be still? 6. How to refrain from anger? Have a blessed Monday! God bless you! As we get ready this morning to worship the Lord in the congregation of fellow believers, let us remember these verses and the emphasis today is on gladness. In Isaiah 35:10 we read, "...the ransomed of the LORD will return. They will enter Zion with singing; everlasting joy will crown their heads. Gladness and joy will overtake them, and sorrow and sighing will flee away." Aren't we the "ransomed of the Lord"? Are we glad this morning? In spite of everything going on in our lives let us rejoice in His presence singing joyful songs, worshipping Him from the bottom of our hearts. The more we worship, the happier we get, the joy of salvation will be renewed in us and no man can take that away from us. Amen! Love you in Christ. God bless you. Let us make this humble prayer of King David as our prayer also. Hidden faults vs. willful sins, two different things, one almost innocent and the other intentional; both equally sinful. Let us give a careful thought to the words here and make it our true statement. That is so beautiful, receiving such showers of blessing this morning; is it not? May God bless you all as we wrap up yet another week and start the weekend. Have a blessed weekend! Yes, Coffee with Jesus brews on weekends too; join us if you can. Paying close attention to the Scriptures here you will notice that it was Martha who invited Jesus to their home in the first place. She had the genuine desire to spend some quality time with the Lord. But when He stopped by though she got busy, preparing a nice meal, setting the table, arranging the center piece etc, forgetting to fellowship with the Lord. She got so overwhelmed to a point of frustration! Mary on the other hand cared the least for the meal or what to feed Him and His disciples but chose to sit at His feet listening to the Lord. Martha is now distraught! She has so much to do and so little time and above all Mary is not helping! Naturally she is irritated and complains about Mary to the Lord. But to her dismay, the Lord takes the side of Mary. 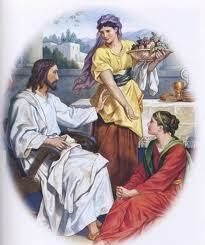 Not that He didn't appreciate the hard work Martha was putting into to make His visit special for Him and His disciples but that Martha didn't come to benefit from the fellowship she could have enjoyed with the Lord. Mary had truly made the best use of every minute she spent with the Lord. She wanted to hear as much as possible. She wanted to share as much as possible. Clearly we all fall into either one or the other category. Are we relaxed when it comes to spending time with the Lord or are we upkeep and busy running too many errands that we suppose are equivalent to spending time with the Lord? Are we distracted like Martha or composed and at peace like Mary? Do we worry and get upset about many things or have we chosen what is better? Do we cherish His fellowship or be concerned about the details? Consider how the lilies grow. They do not labor or spin. Yet I tell you, not even Solomon in all his splendor was dressed like one of these.If that is how God clothes the grass of the field, which is here today, and tomorrow is thrown into the fire, how much more will he clothe you, O you of little faith!And do not set your heart on what you will eat or drink; do not worry about it. For the pagan world runs after all such things, and your Father knows that you need them.But seek his kingdom, and these things will be given to you as well. Do not be afraid, little flock, for your Father has been pleased to give you the kingdom. Sell your possessions and give to the poor. Provide purses for yourselves that will not wear out, a treasure in heaven that will not be exhausted, where no thief comes near and no moth destroys. For where your treasure is, there your heart will be also. Happy 'Son'day! Let's enjoy His presence! Something strikes me about today's Scripture. It is a wonderful promise indeed; but it requires for us to do something. What? Actually 'not doing anything' is what we are required to do. In other words, being still is what we must do! It is the simplest commands of all; yet we all know very well how difficult it is to obey it - especially when our situation calls for a panic or temper tantrum or a quick fix. You can't just be still when there is a roaring sea in the front and chariots of army behind, can you? Right, we can't; not without a strong faith in Him. Romans 10:17 says, "Faith comes from hearing the message, and the message is heard through the word of Christ." That's why it is extremely important to know these scriptures, the Word of God, the promises already given to us. Then when the situations call for panic we will not fear; we will not despair; we will not take matters into your own hands; we will not jump to your own conclusions; we will not lean on our own understanding; we will not fight our fight! We will stand firm and be still believing that our help comes from the Lord! And it will! Amen! He has assigned us our portion! What is meant by hardening of our heart? Is our heart harden today? Have we become insensitive to the Holy Spirit? If we have the slightest doubt we need to work on it. Not too long ago we had discussed Ezekiel 36:26 which promises us that the Lord will remove our stone hearts and give us a heart of flesh. Let us reach out to Him this morning. So, whom are we associating with today? Do we stand firm in our faith that Jesus is the only Way? Or do we reason saying there may be more than one "ways"? Do we know the the Truth from the Scriptures or waver at every new "doctrine" out there? Do we stay clear of idols and sexual immorality that are justified by the false teachers? Are we sensitive to the Word of correction the Holy Spirit reminds us about or ignore it and carry on our lives in sin? When do we need a new song? Only when the old songs aren't enough to praise Him. Which means that the latest deliverance or blessing we received from Him is so good that we don't find anything appropriate to sing and worship Him with. Our heart just opens up bubbling with a new song of praise. It is a wonderful experience when you don't have anything but only gratitude for the Lord. When you come to His presence without the long to-do list but only with praise and worship from a very grateful heart. When we sing such new song of praise, as King David suggests many will see and fear and put their trust too in the Lord. What an awesome way to share our testimony - by being a living proof! I pray that as we all get ready to worship our Savior today, let us for once forget our "shopping list" at home and only go with a grateful heart and a new song of praise. God bless you all and have a great 'Son'day! 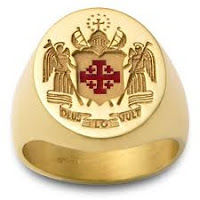 Only yesterday we had seen how we are the signet ring of our Lord. 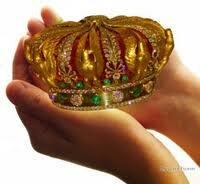 Here we read that we are the crown of splendor in the Lord's hand, a royal diadem or wreath in the hand of our God. To me the reference as a signet ring or a crown or royal diadem held at hand kind of all mean the same thing - precious! Of course crown is different from a signet ring in its purpose. The crown glorifies the king, signet ring attests the authority of its bearer. Normally a crown is worn in the head not held at hand - except when the King is about to wear it, of course. Let us not waste our focus on why it says "crown in the Lord's hand and not head". The point here is that we are very precious to our Lord. He will value you as dear and precious as a king does his crown. Would a king forget or give up his crown? Not our King! We are very precious for Him. Past few days we have been discussing the same verse Micah 6:8. Today's focus is on 'Walking humbly with our God'. We would think it is something to boast about - right? Walking with the Lord? Apparently not! As the verse suggests walking humbly is what is required of us; humbly is the key here. So, how do we walk humbly with the Lord? I guess this comes with maturity. As we grow more in Christ we become less significant in our sight. Apostle Paul writes in 2 Corinthians 3:5, "Not that we are competent in ourselves to claim anything for ourselves, but our competence comes from God." Looks like these people knew a thing or two about walking humbly with the Lord. We can learn from their example, can't we? What does it mean to love mercy? Better yet, what is mercy? Looking up the word in the dictionary reveals mercy means pardoning some one's punishment or being compassionate to our offenders. It is also an act of kindness, compassion or favor. Mercy is one of the strongest qualities of our Lord. Lamentations 3:22 says, "Because of the LORD's great love we are not consumed, for his compassions never fail." Other translations have it as "His mercies never cease". In Psalm 103:10 we read, "He does not treat us as our sins deserve or repay us according to our iniquities." The same question is directed towards us today. How merciful are we? Do we love mercy? Shouldn’t we have mercy on our fellow men just as He had on us? Yesterday we discussed that one of the few things expected of us by our Lord is to act justly. Today we are going to discuss how to do just that - act justly. First we need to understand what does 'just' mean. In Deuteronomy 32:4 we read: "He is the Rock, his works are perfect, and all his ways are just. A faithful God who does no wrong, upright and just is he." In Leviticus 19:36 we read of an instruction from the Lord: "Use honest scales and honest weights, an honest ephah and an honest hin. I am the LORD your God, who brought you out of Egypt." From these verses we can understand that being just means to be faithful, honest and not doing wrong. Now getting back to our original question, how to act justly, let us read on. 1 John 3: 9 says: "No one who is born of God will continue to sin, because God's seed remains in him; he cannot go on sinning, because he has been born of God." So, ultimately we need to be born of God. What does it mean to be born of God? It is to realize that we are sinners and to recognize that Christ died for our sins on the cross and that the blood of Jesus Christ washes our sins. Repenting and asking for forgiveness for our sins makes us a whole new person - born of Christ! When we are born of Christ He enables us to walk justly! With what shall I come before the Lord? We at times forget what is ultimately required of us by the Lord. Is it how much we give? No! Is it our being regular to church? No! How about we fast and pray for three days? That will be good idea but not something required of us by the Lord. Well, then what is really expected of us? Walk humbly with the Lord! Amen! He is risen! Happy Resurrection Sunday to all who are joined here from all over the world. The only thing that brings us together is His Holy name. The only thing that binds us closer is His love! Isn't it anazing how we all can unite under His Holy presence from far off places and still feel so connected! We have all the more reason to rejoice this morning as we celebrate the resurrected Christ! Our Savior! He is risen! Not only that, we too will be risen oneday. If the Lord tarries and we pass on, at a twinkling of an eye when the trumpet calls we will rise and be caught up with the Lord in the skies. (I Corinthians 15:52) How awesome is that! Let us sing Hosannah to our King all the more louder this morning and rejoice in His presence during the worship service. Let us not allow anything or anybody spoil the joy of our salvation this morning. We will Rejoice! For He has risen! It is hard for many to believe Jesus is the Lord and even harder for them to accept the fact that He is risen from the dead. To be honest, we believers too struggle with a shadow of doubt from time to time. Who will roll away the stone? How can we overcome our doubts? The plain and simple answer is: "By His grace!" Ephesians 2: 8 & 9 says, "For it is by grace you have been saved, through faith—and this not from yourselves, it is the gift of God— not by works, so that no one can boast." So, any time doubt shadows our faith, let us cling closer to His grace, rushing back to the foot of the cross, and being saved all over again. Amen! His grace and love will roll away the huge boulders of doubt in our lives - if we look up to Him. I know most of us keep a grim face today as we recall the suffering of our Lord Jesus Christ on the cross. But I believe we need to rejoice for His sacrifice as otherwise we would be doomed forever. Now we are redeemed! Praise the Lord! So indeed it is a day of celebration and not necessarily a day of mourning for us believers. As with the norm in many churches worldwide let us also quickly look at the words spoken by our Lord on the cross. People give extreme importance to a person's last words, do they not? When we hear of someone's demise one of the first questions we ask is, what did he/she say last or when did you speak to him/her last. Jesus's words on the cross are therefore important too, though these are not His last. He lives and continue to speak! Amen! God Himself in human form came down to rescue us. He submitted fully even unto death to redeem us - the human race. He died a painful death thus fully paying off for the punishment of every sin ever committed by any person - whoever believe(d)! I do believe! I am sure you do too. He Lives! Let us rejoice! If you have time today please read Isaiah 25th chapter. It is a praise and worship song by prophet Isaiah, no wonder it sounds like a chapter from the Psalms. If your native tongue is different from English, I strongly encourage you to read and grasp the full meaning of today's verse in your language. You will appreciate the in depth meaning of the passage. When the ruthless attack us with their storming words and heated arguments, it is the Lord who gives us shelter against them. He is the refuge for us in our distress, a shelter from the storm and a shade from the heat. On the other hand, intentionally or unintentionally when we become ruthless to the poor, using unkind words against the needy, showing fierce anger against the less fortunate, causing them distress, or "storm", then they will look upon the Lord who shelters them. As much as we don't want to be treated by the ruthless, let us not become ruthless also. Even very "good" Christians get carried away by race, status, ethnicity and the such, looking down upon people of different backgrounds. Let us remember always that when we mock a poor we mock his Maker who is God Almighty. Let us examine our self if over the years we have become ruthless somehow. How do we treat our children? Can they see us as a role model that they can follow? If you have the slightest doubt now is the time to repent and be set free. Many of us wonder how we can find out the will of God in our lives. Today's Scripture gives us the answer for that. If we do not conform to this world, but are transformed by the renewing of our mind, then we will know what is the perfect will of God for us. Isn't that simple? I believe it is smart, holding us responsible for knowing the will of God! Instead of saying, ask your pastor or check with your parents to find out what God's will for your life is, the Scripture clearly says it is within our capacity to know His will! That arises further questions: What does it mean to conform to the world? How not to conform to the world? How to be transformed by the renewing of our mind? In the Gospel of Mark when we read about the parable of the sower, chapter 4 verse 19 says, "...the worries of this life, the deceitfulness of wealth and the desires for other things come in and choke the word, making it unfruitful." This is conforming to the world. This is what the ungodly do - they worry for this life, they deceive for wealth and they desire worldly things. But not so are the godly. We need to live a life without conforming to the world. ... You were taught, with regard to your former way of life, to put off your old self, which is being corrupted by its deceitful desires; to be made new in the attitude of your minds; and to put on the new self, created to be like God in true righteousness and holiness. Therefore each of you must put off falsehood and speak truthfully to his neighbor, for we are all members of one body. “In your anger do not sin”: Do not let the sun go down while you are still angry, and do not give the devil a foothold. He who has been stealing must steal no longer, but must work, doing something useful with his own hands, that he may have something to share with those in need. Can we try these suggestions? Then our mind will be transformed and we will not conform to this world. His perfect will will be proven in our lives. What say? 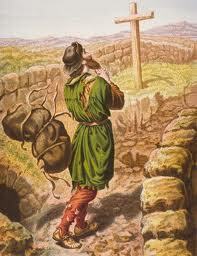 For today's coffee I would like to share an illustration from John Bunyan's book The Pilgrim's Progress. Christian - the lead character in the book, is on a journey - from the City of Destruction to the Celestial City. Christian is weighed down by a great burden, the knowledge of his sin, which he believed came from his reading "the book in his hand", (the Bible). This burden, which would cause him to sink into Tophet (hell), is so unbearable that Christian must seek deliverance. He meets Evangelist as he is walking out in the fields, who directs him to the "Wicket Gate" for deliverance. He is diverted by Mr. Worldly Wiseman into seeking deliverance from his burden through the Law, supposedly with the help of a Mr. Legality and his son Civility in the village of Morality, rather than through Christ, allegorically by way of the Wicket Gate. Once again the Evangelist meets the wayward Christian as he stops before Mount Sinai on the way to Legality's home. It hangs over the road and threatens to crush any who would pass it. Evangelist shows Christian that he had sinned by turning out of his way, but he assures him that he will be welcomed at the Wicket Gate if he should turn around and go there, which Christian does. At the Wicket Gate begins the "straight and narrow" King's Highway, and Christian is directed onto it by the gatekeeper Good Will. To Christian's query about relief from his burden, Good Will directs him forward to "the place of deliverance." Christian finally reaches the "place of deliverance" (allegorically, the cross of Calvary and the open sepulcher of Christ), where the "straps" that bound Christian's burden to him break, and it rolls away into the open sepulchre. The point of focus for our discussion is, when we lose our burden of sin and guilt at the cross, we pick up a lighter load and continue on the journey. This lighter load indicates the teachings of the Scriptures, the areas in which we need to improve, loving, forgiving, etc to become more like Jesus every day. Compared to our original bundle of sin, this yoke is very light and not a difficult task at hand. Might seem so at times but by His grace we can do it! Amen! We sometimes tend to forget the essence of the Gospel in our lives. We become less sensitive to the ultimate sacrifice our Lord and Savior Jesus Christ bore for us. This week as we celebrate the resurrection of the Lord, we will meditate on His sufferings for us. My Lord Jesus Christ was pierced for my transgressions! My Lord Jesus Christ was crushed for my iniquities! My Lord Jesus Christ bore my punishments upon Himself! My Lord Jesus Christ brought me peace! My Lord Jesus Christ was wounded for me! My Lord Jesus Christ healed me! Gospel is very personal folks! It is not as generic as we tend to think of at times. True He died for the entire human race. But more importantly He died for me! For you! On a personal level. One on one! It is like dying that many times all over again! Let us not make light of His sufferings for us. Let us not let His blood go wasted. Let us be rinsed all over again, engulfed by His supreme love. Let us be mindful of the fact that He took our place on the cross! Amen! We will have a open discussion on this passage over the coffee table today. If anyone has questions on this passage bring it on or feel free to share your thoughts. One question to keep in the back of our mind today is: Are we invited or chosen? Further, do we have the wedding garments?